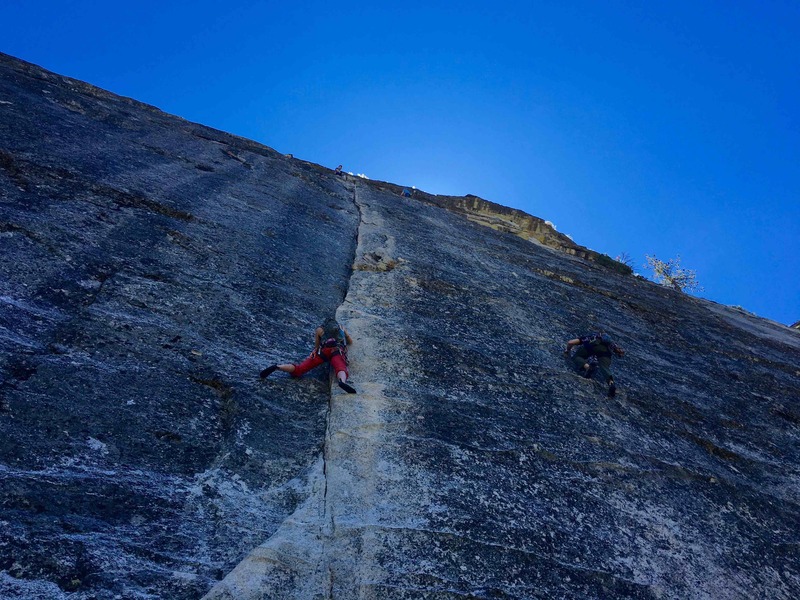 Keeping in pattern with a climbing trip every weekend I signed on to go to Lover’s Leap in South Lake Tahoe where huge rocks charge up from the surrounds just off I-50. 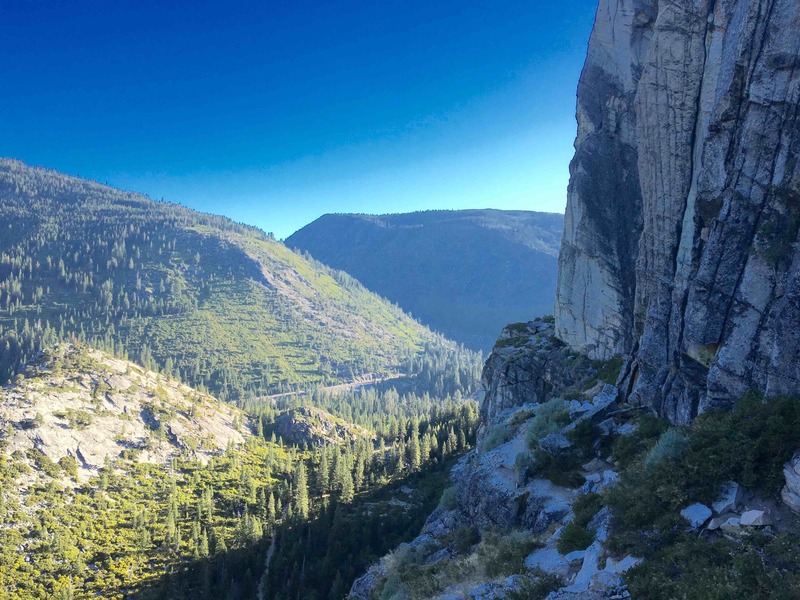 The area is very popular due to its easy trad multi-pitch routes and relatively short drive from the SF Bay Area. I wound up leading a couple really great climbs, having an unexpected fantastic evening with friends and a surprise single strange rappel adventure. I was able to route find pretty well with just Mountain Project, but the guide book everyone else had would have saved me some time. For once leaving work at 7pm didn’t spare me traffic. Google maps brought me through SF and I hit construction so I rolled into camp about 11:30pm. Luckily another member of the group got campsites at 2pm so I could just throw out my hammock and get to bed. There were still many spots available to park when I arrived but it filled up between midnight and when I woke up at 7am the next day. Photo from initial belay of Wallbanger Left. Party on right is at Wallbanger center belay. People get up early at the Leap! Since my follower was new to crack climbing I was going to lead a couple easy routes off the North Wall of Hogback to introduce the technique. However, even getting to the wall at 7:00am there was already someone on each the two higher ranked routes Deception (5.6 ★★½) and Knapsack (5.4 ★★). So we went up to Wallbanger Center (5.6 ★★) and after topping out walked off to climb Wallbanger Left (5.8 ★★). The routes were not very interesting nor very-cracky so we didn’t spend any more time here after these two 250-300’ routes. The picture on Mountain project’s Wallbanger Center was great for finding the lines and starting belays for any of the Wallbanger routes near the high lone pine. The East Face hosts many of the classics of The Leap, is a fairly level approach and stays in the shade most of the day until about 1pm. Despite all these benefits there were much less people on this wall compared to the easier stuff on Hogsback where we left about seven parties. This puzzled me but I thanked my good luck while picking out a route that looked to be bomber. “The Line” a 5.9 ★★★½ climb up 400’ of vertical crack. 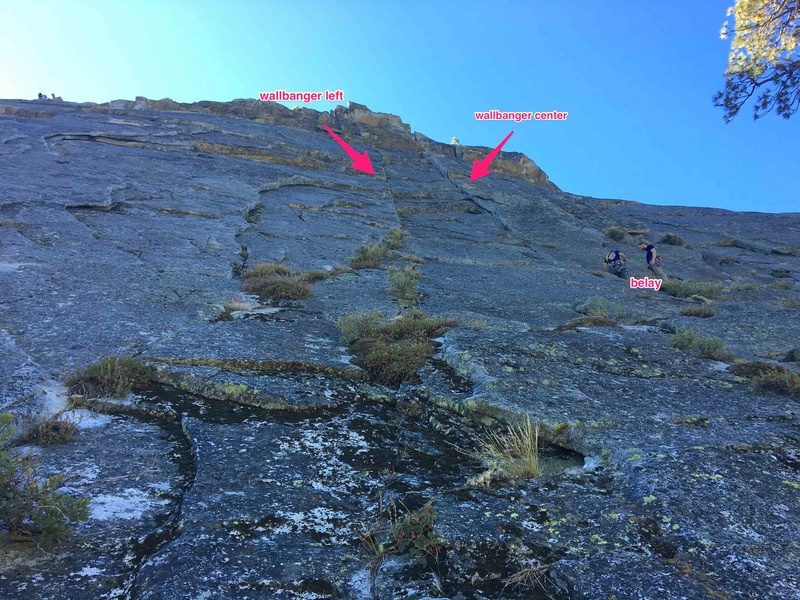 Finding the route was easy after noticing the vertical crack with some lighter coloration around it for half of its height up wall. For face climbers like my partner most sections had extra feet or hand holds near the crack, but he had trouble on the sections where these were not available. For me however, it was exactly what I was looking for. A solid crack with decent sized finger cracks and regularly spaced solid hand jams. The first pitch is ultra enjoyable. 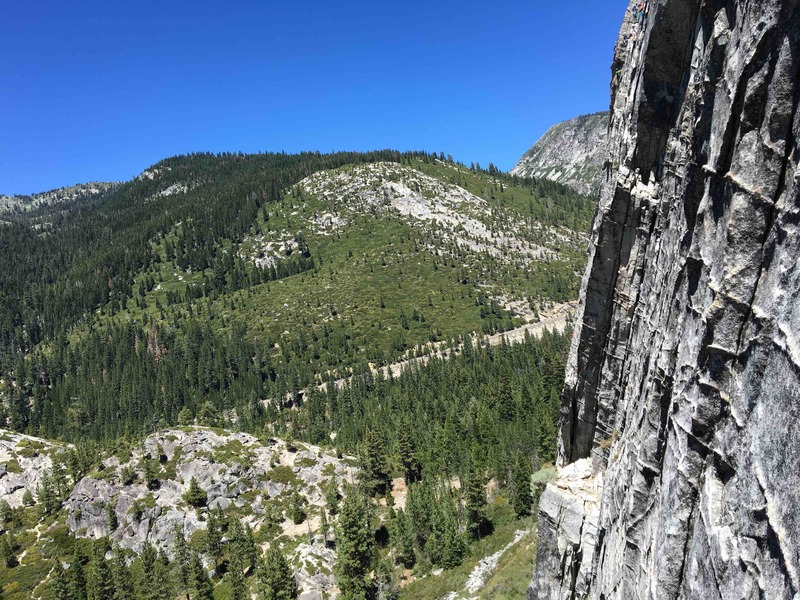 Looking to do the route in two pitches and not three I breezed past the suggested first belay over confident by the solid crack I had experienced to this point. However, after this belay the crack quality degraded for protection and flared outward. I ended up creating the sketchiest anchor I’ve done to date off a ton of small cams in flared out cracks. Even adding a fourth piece didn’t comfort me. While my partner struggled up the first pitch one of his falls popped a cam out which did not add any comfort as I had him ease off the rope and I tried to re-apply the cam more securely. I had this popped cam on my mind as I began my second pitch lead. The quality of the crack didn’t improve much until the end of the climb. Which was good because I almost took my first trad fall above gear. Mid-move on a high right legged mantel my left foot slid out and I pendulum around my solid right foot. Luckily I did this in a controlled fashion and caught myself, collected myself and shoved myself over. Hey My Rope Doesn’t Reach the Ground! 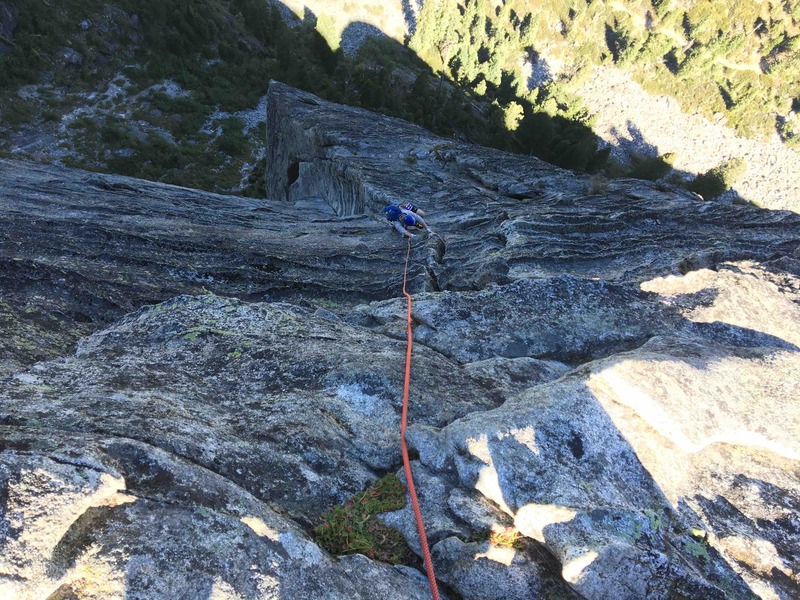 My assumption was a 70m rope would be enough for any rap anchors, but if I had read Mountain Project I would have known Labor of Love anchor was 40m high… Situations like this are why its so helpful to review rescue and bailing techniques when climbing trad. Things happen. Luckily after an interesting rappel several weekends back at Shuteye Ridge I researched single strand rappelling and memorized it. However, this would be the first time I would do it in person. For real. With my life on the other end. I failed to ascend the rope due to my little experience with jugging (how you actually do it) so I self-belay climbed back up the 15′ to reattach the slings. This time my knot held and we were headed back to camp as the sun went behind the mountains at 8:30pm. The rest of the night went fantastically. I ran into my friend and his group also at the Leap. We walked down to Strawberry Lodge for warm burgers and a drink. Ending the night sitting around a circle with no light gazing at the stars, passing around a beer, joking, laughing and sharing stories. It was a perfect moment. Looking west from the base of the Main Wall. Corrugation Corner is tucked around the corner. Given the early risers of The Leap we also started early on Sunday. I had thought we would climb up the Lower Buttress and do whatever was available on the Main Wall. 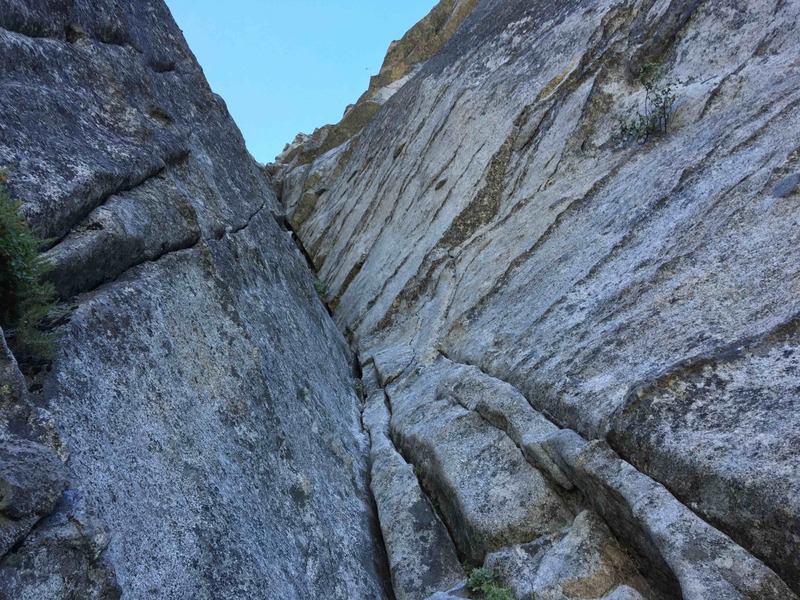 However, at 7:15am both Surrealistic Pillar (5.7 ★★★ with awesome exposure) and The Groove (5.8 PG13 ★★½ star) had climbers on them so we blew past and decided to hike up to the Main Wall. It was a bit of a hike, climbing would have been more fun. However, when we reached the top the Main Wall was empty! I double checked my map about seven times because I couldn’t believe I was the first on Corrugation Corner (5.7 ★★★★) at 8:15am given how busy this classic route was. Once on the wall I could see why the route was so highly rated. The climbing had a lot of lower grade climbing with various techniques. There were a couple short easy chimneys, a traverse and lots of holds if you didn’t want to stay in the crack. The exposure was pretty real and could make me focus more on pro than on enjoying the climb. All this variation means the route moves left to right a little bit and I was super glad for the free map from SuperTopo so I didn’t end up on the 5.8 offwidth straight up from the first pitch! View of pitch two from the base of belay. 5.7 crack on the left. 1st Pitch: The first pitch itself is pretty uneventful. Just climbing the dikes up. The unprotected 5.5 climb to the first anchor was a little interesting for my nerves but not challenging. 2nd Pitch: The second pitch offers a ton of exposure with some decent crack climbing as you head on top of an arete and into a very easy 5.5 chimney until you have to do this ‘belly flop’ on to the left ledge. I definitely didn’t flop but more beached myself like a whale pushing with my legs, balancing on my chest without hands. I built another sketchy anchor here in flaked out cracks at the base of the chimney. The party behind me seemed to have set up anchor in some more solid crack near the base of the next crack rather than the chimney. 3rd Pitch: Shimmying my way up a very secure chimney above this poor anchor I was able to place a bomber #3 at the top to protect the very exposed 5.7 traverse right. On the traverse I was happy for the piton midway protecting me from a pendulum into the rock if I fell. After this part it was a fairly easy line up to the top. Once the aretes come together its just dike and hand-jam city up to topping out where I slung some boulders for my anchor. It took us about 2.5 hours to climb the 460′ of Corrugation Corner with a half hour decent put us back at the parking lot at noon. My partner was done for the weekend so we headed back to the bay. My favorite was definitely “The Line” since it was just solid 5.9 sustained crack climbing. Also, if you’ve done any crack I’d avoid Hogsback. I really didn’t enjoy the wall, its not that interesting and is too busy.